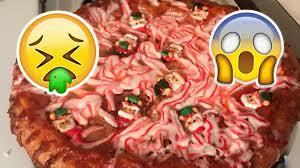 Would you eat this candy cane covered festive pizza? Some people are totally not okay with this. Some people aren’t on board with this festive take on pizza! This pizza is piled with candy canes, cheese, and little chocolate elves. David shared images of it on a social network and ignited a huge debate about pizza toppings! Somebody simply said ‘I’m calling the police’, believing that a pizza that bad shouldn’t be allowed! That’s what another user said and loads of other people said that the pizza earned him a place on Santa’s naughty list.